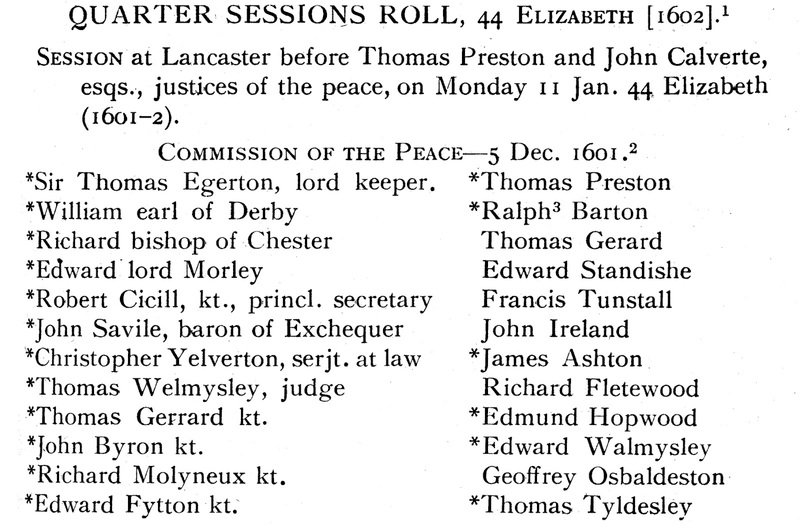 Thomas Tyldesley 1557-1635 was appointed to the Commission of Peace on 5 December 1601. This was a renewal of an earlier appointment since, for example, William and John Reeve of Westhaughton were ordered to appear before him in July 1601. 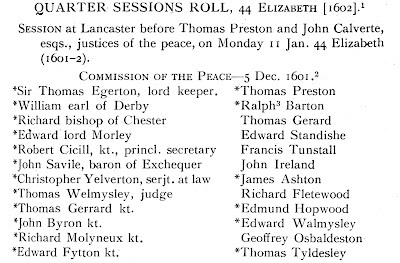 Session at Lancaster before Thomas Preston and John Calverte, esqs., justices of the peace, on Monday 11 Jan. 44 Elizabeth (1601-2). 1. Sessions House, Preston, shelf AA.i. 2. On m.17d is another commission dated 26 March 1602. It contains the names asterisked in the list above, but not always in the same order : R. Fletewood and G. Osbaldeston added to the quorum. On m.26 is another dated 13 Aug. It omits Yelverton and adds Sir John Fortescue; B. Kitchen is added to the quorum.